WHEN YOU THINK of higher education, chances are that virtual reality is not something that immediately comes to mind. In recent years, online learning has changed the face of education by becoming a supplement to traditional methods, allowing people to learn at a distance, on their own time and at their own pace. It has become a powerful tool for educators to expand their reach while providing students with a way to get an education without having to step foot into a classroom. Despite these advantages, online education has proven to be a double-edged sword. At some point in their learning, every student needs personal help that interactive workbooks and textbooks alone cannot provide. Relying solely on asynchronous communication with a faceless professor stifles the kind of momentum that a classroom setting promotes. Classrooms and lectures allow students to engage with their professors, teaching assistants and with each other. Students have the ability to raise their hand to get clarification in the moment, when it is most useful, rather than having to send an email and await a reply. Students can be broken up into work-groups for projects; and potentially most important of all, students can turn to other students and ask them questions, make study-groups and form friendships and rivalries that provide emotional motivation for pushing themselves to learn more and succeed. The highest quality education must be social and interactive, and although online learning provides a degree of that via a website, the practicality of the real world instant feedback and social dynamics are missing. Virtual worlds promise to deliver the best aspects of both real-world classrooms and online distance learning into a single platform. With tools that provide avatars that represent the educators and the students, voice and video capabilities, powerpoint and other collaborative whiteboard technologies and group and private messaging chat, educators are finding that the newest generation of virtual worlds can simplify the lecture and presentation process, allow students to ask/answers questions to their teacher or each other (without interrupting the lecture), socialize and learn in a very streamlined manner. All of this is done with the convenience and cost efficiency of distance learning. Although the promise of virtual world education appears heightened for certain subject matter, educators are finding that in truth, any subject can be taught in this setting. The most seemingly advantageous is subject is history where, for example, one can recreate something like the Civil War, and provide virtual field trips to tour the battlefields and march in high speed where the armies travelled in The South, even meeting George Washington. Similarly for political science, students can walk through the Washington, DC to follow a bill as it gets turned into a law. This is what the Harlem Project inside Utherverse Digital aims to do. The brainchild of University of Arizona Assistant Professor of African American Studies Bryan Carter, it is an academic initiative to produce a virtual version of 1920’s Harlem. Using state of the art graphics, which are comparable to contemporary video games, it will educate as well as entertain students through uniquely realistic re-creation of a time period that no longer exists. “This virtual setting allows for students to see the inspirations behind the literature or works of art they are studying, which will be invaluable to engaging this generation,” says Dr. Carter. Harlem, New York and Montmartre, Paris, both hubs of the Harlem Renaissance, will be featured in all their historical glory, just as they existed in the 1920’s Jazz Age. 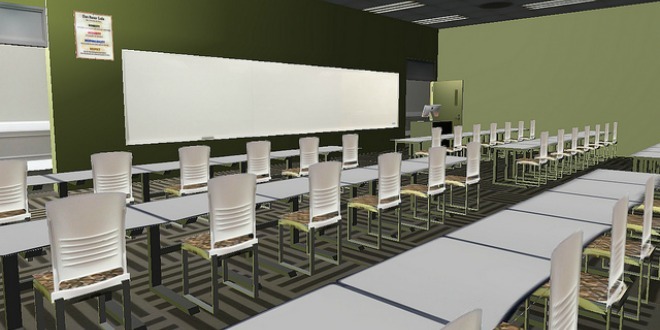 Education becomes truly interactive in a virtual setting. Foreign language learning generally requires total immersion. Virtual worlds enable the ability to place students from a French class, directly into “field trips” of, for example, tours of virtual Paris to see the sights and learn, in an amongst actual native speakers of the French language, as though they were actually there. Enabling students to meet other students who are learning the same material as they are allows students to leverage their classmates to increase their understanding of the subject material and generally makes learning more fun. Virtual World environments have an enormous advantage when it comes to engaging with other students, even at a distance. A truly multi-threaded education requires a level of social interaction for any subject matter. Even subjects like math or chemistry, which generate lots of questions and which can be challenging in a strictly online web setting, will benefit from the coming virtual world transformation. Students are going to have questions, and being able to facilitate discussions via chat, allows for that social component that is important for real-time, instant clarification that can be the difference between having a classroom of students lost for the entire balance of the lecture or gaining the understanding in real time and then being able to follow the rest of the talk. All the technologies that facilitate education can happen in a virtual classroom, including the ability to record lectures, so that students can come back and listen to it later, replay the parts that they need to hear again and not have to rely on extensive notes. Students can attend classes from anywhere that there is Internet, and the costs of transportation and housing can be vastly mitigated. Virtual learning will open the doors for people to access the best kind of education by blending together the best of the real world, the best of the internet and online applications, and the best of the virtual world technology so that the most modern techniques are utilized to obtain that education. One of the pioneers of the internet, Brian Shuster is CEO of Utherverse Digital and Ideaflood. Why should build a mobile surveying and monitoring system?